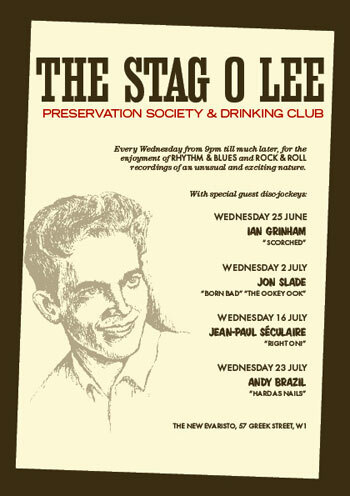 If you happen to be in London and want a way of breaking up the midweek, the Stag O Lee Preservation Society and Drinking Club could be for you. Every Wednesday, from 9pm until late, you can take in some R&B and rock and roll with a selection of guest DJs (all listed on the flyer above for the coming weeks). Check it out at the New Evaristo, 57 Greek Street, London W1. If you want more information, drop an email here.